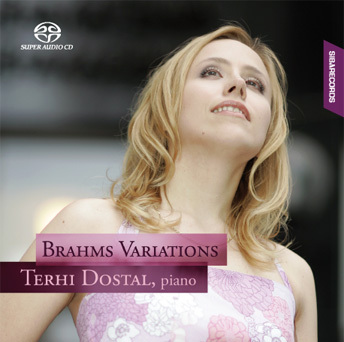 "This new disc by Terhi Dostal is without a doubt the most satisfying Brahms recording I’ve yet to lay ears on. (...) Dostal plays Brahms as if the composer’s spirit inhabits her body and soul. Soft passages are of feathery lightness and delicacy, loud passages are of visceral amplitude and force, and passages of virtuosic fireworks flash like bursts of diadems lighting the night sky. Dostal’s playing is no less amazing for its technical execution than it is for the sense of oneness with the composer it seems to impart to the music. It’s almost as if she has a direct line of communication to Brahms as he guides and informs her every move." "Finnish pianist Terhi Dostal proves that she is a skilled interpreter of Brahms on this album of the legendary composer's solo piano works. One of her strongest interpretations is Variations on a Theme by Schumann. She begins the chorale-like entry solemnly, rolling the chords beautifully. Dostal is an introspective player with a lot of inner focus, yet in the dramatic variations she is full of fire, playing with precise, percussive attacks. Dostal is capable of switching musical moods very quickly, something which is necessary to a piece made up of variations." "Terhi Dostal plays Brahms wonderfully, the works are accurately analysed and interpreted and the playing is certain from the beginning to the end. The special feature in Dostal's pianism is the strongly internalized interpretative security and the peace created by it."